Audiovisual technology is profoundly transforming the modern travel experience. 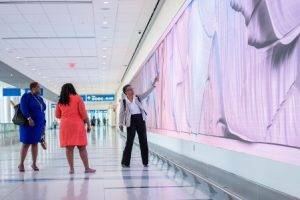 Turning traditional wait times into times of engagement at forward-looking airports around the world — most recently at the Charlotte Douglas International Airport, which just completed a $200-million renovation and expansion of its Concourse A. The nine-gate, 229,807-square foot addition is the first completed project under the Destination CLT initiative, a $2.5 billion capital investment program to renovate the concourses and expand CLT’s roadways, curb front, airfield and terminal. The Concourse A expansion features ENGAGE Series and Performance Series LED displays from NanoLumens, award-winning creators of uniquely compelling LED visualization solutions in any size, shape, or curvature — and renown digital artist Refik Anadol’s unique “data sculptures” that turn the airport’s invisible patterns of data into captivating and ever-changing content featured on the three NanoLumens displays. 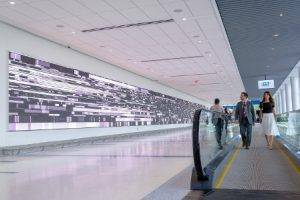 This alluring installation, dubbed “Interconnected,” is a part of a total commitment by the airport to reimagine modern travel through the eyes of compelling and immersive digital experiences. 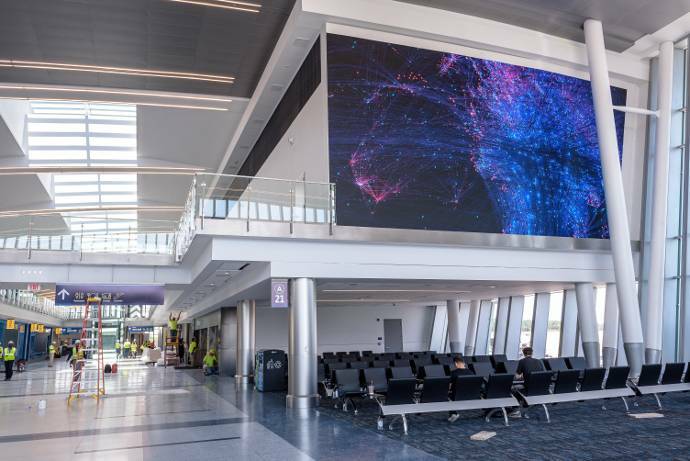 The airport was originally considering projection technology for this project but from previous experience Anadol knew that only NanoLumens display technology could properly handle what is being described as one of the largest data sculpture visualizations in the world. 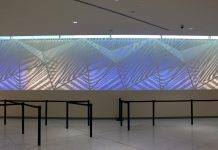 “Once we picked Refik as the artist to do this project we presented the NanoLumens solutions to him and he immediately knew their displays would be perfect for this project and for his artwork,” explained Marcus Mitchell, Program Director for the Arts & Science Council, the organization that ran this project on behalf of the airport. The NanoLumens ENGAGE Series displays are an ideal solution for any area where crisp images and close- up viewing are required. And unlike traditional displays which are heavy and difficult to support, ENGAGE Series displays can be installed and front serviced, and require no fans or air conditioning. Cenero installed two additional 4.7mm NanoLumens Performance Series displays in oddly shaped corners in the gates located at the end of Concourse A that are also visible both inside and outside the airport. 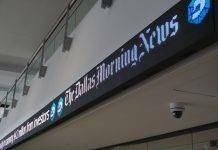 The trapezoid-shaped displays measure approximately 28×15-feet in one corner and 40×19-feet in the other corner. NanoLumens Performance Series displays are optimized for flat installations and high brightness, and transform the way the viewer is engaged. At just over 3-inches deep (approximately 79mm), these ultra-thin displays create perfect corners and are available in any size with pixel pitches ranging from 3-9mm. 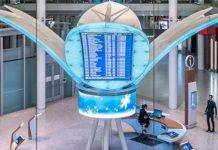 Each of these displays also run 24 hours a day and are synchronized with the larger concourse display as each has its own distinct visual chapter.